Summary: Owners of foam rollers like this one from Fit Nation have an advantage over the rest of us. They can sooth knotted and tense muscles (legs, back, shoulders primarily – though other groups too), and get relief fast. For a very small price, owners of muscle massage foam rollers know that they can push themselves just that little bit harder when exercising, as relief is easier to come by for any soreness afterwards. 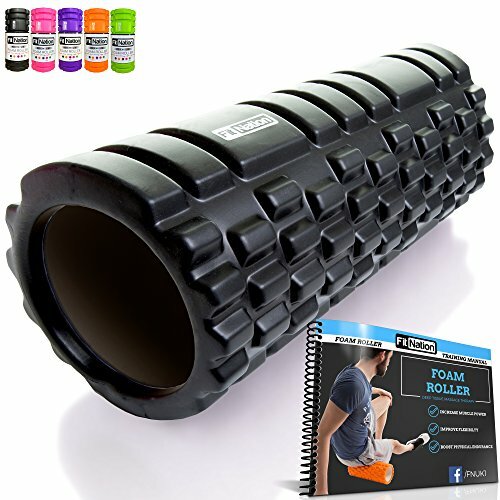 If you have ever held yourself back to make sure that you do not feel sore the next day – then I strongly recommend you check out the feedback from ordinary fitness fans in the comments of the amazon UK product page for the Fit Nation foam roller. This is a low priced item, that could well have very big effects!  BECAUSE MUSCLE PAIN DOESN'T DESERVE YOUR TIME ! Use your foam roller to banish muscle pain fast! No one knows better than you as to exactly where you are feeling tense, exactly where you need relief and exactly how much pressure you need. Massage those tender muscles and eliminate your aches and pains with the #1 rated foam roller by Fit-Nation®. What you get is a high quality foam tube, this is 33cm long, and around 14cm across. It is pitted and slatted in such a way as to give different muscle groups a massage as you roll over it – using your body weight to apply pressure. The coating is both high-density and environmentally friendly. Fit Nation have made a significant effort on their product page to differentiate themselves from cheaper copies – stressing the high quality standards of the roller. You will also get a bound instruction booklet, which explains (visually) 10 of the most common roller exercises to soothe the major muscle groups. Some digital extras are also added, in the form of eBooks (with more exercises) and an explainer video on the Fit Nation website. The idea is that you lay on the roller and move back and forward, propping yourself up where needed. The nodules on the roller then work out the tension from the right muscles – providing a deep massage which to the right areas. As an extra benefit the balance required to complete the exercises can strengthen your core / abs and improve your ability to balance. I was surprised by the positive feedback from users who enjoy a variety of different sporting activities. Runners are big fans of foam muscle rollers, reporting that this product works very well for working out tension in the calves in particular. Working through injuries (such as shoulder injuries) was also mentioned in the comments. I can certainly see how a roller would help in this area, though of course I have to add the usual disclaimer that you should always seek the advice of a medically trained professional before beginning any type of self-treatment. Overall, the Fit Nation foam roller muscle massager has very positive feedback (overwhelmingly 5 stars). The level of service from the people that produce and supply them has been singled out in the comments several times – and I am sure is a major factor in the high overall rating. Sure, you can save a few pounds by buying a cheap Chinese copy – though can you be sure that the nodules are in the right place? Or that the quality is up to scratch for regular use. Check out the product page of the Fit Nation Foam Roller now, for a small investment you could be free of muscle pain for many years to come!